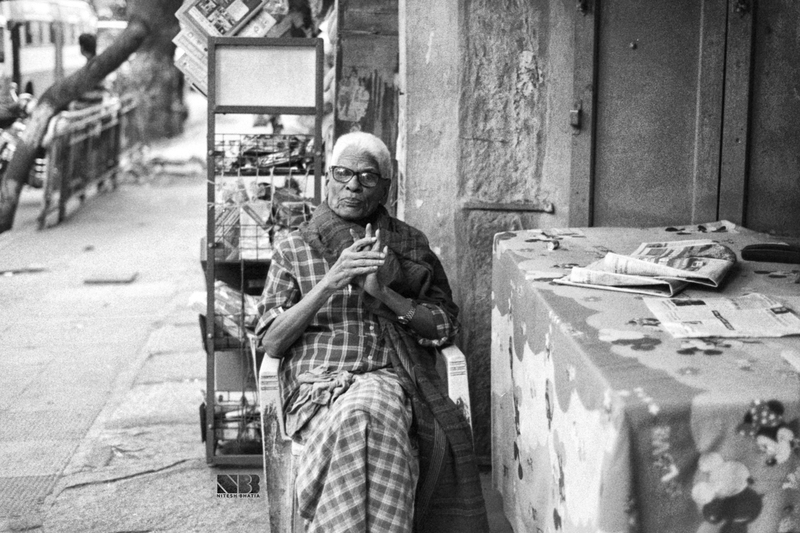 Portrait of an elderly sitting next to his shop at Malleshwaram (Bangalore). 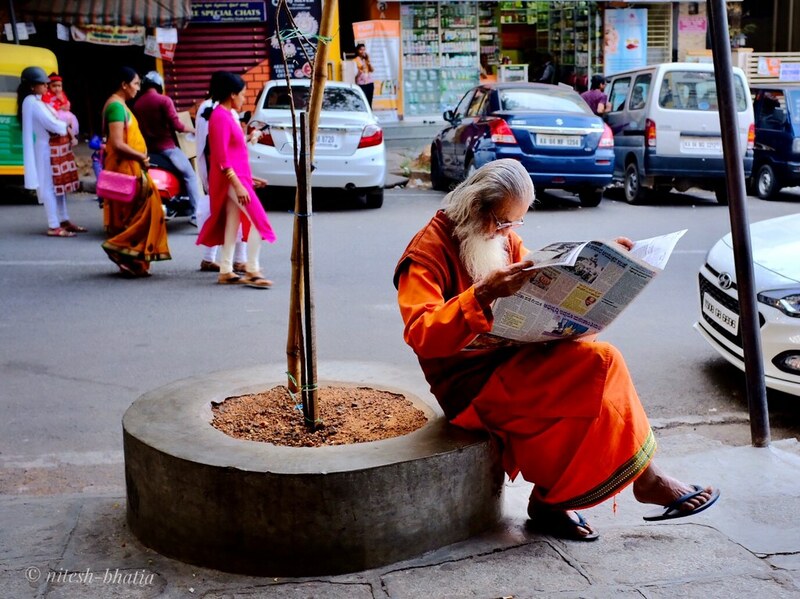 While crossing the street, quite often I see him, sitting silently. Usually, there is one more person who works in this laundry (or a tailor) shop. One evening, I was walking down the street and thought of taking his pic. I gently asked and took this portrait. Shot with 35mm Orwo film (pushed to 800) and Nikon 50 mm. For film development notes, please read my previous post: Man with an Electric Tuktuk. Portrait of an elderly sitting on a platform adjacent to a shop. It was evening, and I asked for a photo. He agreed. Shot nearby my home (in Ajmer), in an area previously famous by the name "Chungi Naka", having a multitude of stores and makeshift vegetable carts (fresh from nearby villages!). During my childhood, I used to visit this area a lot. Now, with the construction of a new flyover, the area has been cleared. It has lost its active identity (at least to me!). Most of the shops are gone. 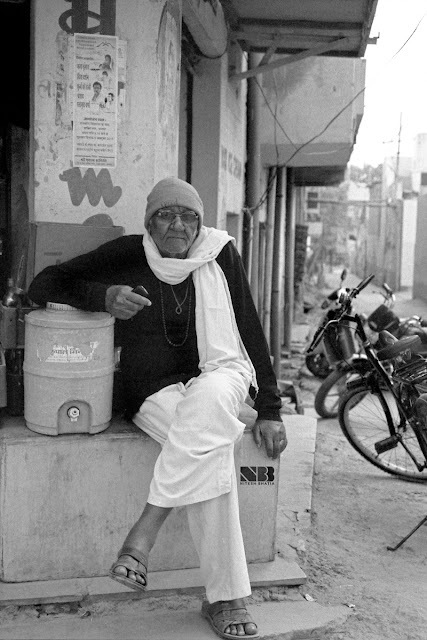 However, as evening approaches, people socialize near shops and have tea-chai-bidi, as usual. But very few people know me now (penalty for growing up and moving, alas!). Shot on Orwo N74+ film pushed to 800 with a 50mm Nikon. For film development notes, please read my previous post: Man with an Electric Tuktuk.